Mr. Rabbitte and his sellouts collaborators in the Dail should be hounded everywhere they go! An overpaid stuffed up face of a puppet labour politician get to hear what the people of Ireland want to say. Mr. Rabbitte and his sellouts collaborators in the Dail should be hounded everywhere they go until they get out of the Dail and their lottery pensions taken away from them ! I am so frustrated by the absolute incompetence of our gombeen politicians. On east coast radio this morning I had to endure the utter tripe and garbage, coming from a 25 year old TD from Fin Gael who hasn’t worked a single day in a real job and yet this Gob***t has the gall to preach to us the downtrodden taxpayers ,why we should continue to pay these new poll taxes and stealth taxes , as we see local services disappear from our local communities .This self centred leach, is just an example of the latest batch of Liars, and puppets who are been groomed to take the helm on the good ship “Austerity Ireland” as she sails into “Financial oblivion”. whilst at the same time topping up on his expenses and pension entitlements. Our country is been raped and pillaged and gangsters who are running the government .The Banker autocracy is well entrenched into the very fabric of our society .The same bankers are now more powerful and are dictating policy .We will never be able to remove these criminals as they do not come up for election and no matter what current political party gets into the Dail these crooks will still have enough power to force their interests to be placed about that of the ordinary people of Ireland . The latest budget was dictated to the current puppet government and any new revenues collected will only go to paying off the “Odious debts” of gamblers and downright gangsters. Our local TD’s are only out for themselves and have proven to gutless liars who are well able to come on to the local media and waffle on about the “Greater good” .This is of course as long as they continue to enjoy lottery salaries and perks Obama would be embarrassed to take . The rich are getting richer and the poor are getting poorer! Richard Boyd Barrett TD for the People Before Profit Alliance/ULA challenged Taoiseach Enda Kenny today during leaders questions over the “gross inequality and unfairness” in the manner in which “the pain of austerity policies has been imposed on the least well-off and most vulnerable sections of Irish society, while the wealthiest people in the country have been protected and in some cases have actually increased their incomes. Deputy Boyd Barrett’s challenge to the Taoiseach comes in the aftermath of Social Justice Ireland’s recent report showing that the poorest households in Irish society have seen their disposable incomes decline by 18% whereas the wealthiest households have seen their incomes actually rise by 4%. Deputy Boyd Barrett also referred to answers he received recently from the Minister for Finance in response to Parliamentary Questions on the annual incomes of the highest earners in the country and the levels of effective tax paid. The answers provided by the Minister to questions submitted by Deputy Boyd Barrett detailed the earnings the top 10,000, top 1%, top 10%, top 20% of earners and showed that these very high earners are only paying effective income tax rates of between 29% and 21%. For example, the top 10,000 earners with total earnings of €5.959 billion and average earnings of €595,905 per year paid only €1.715 billion in income tax, an effective tax rate of 29%. The top 10% of earners with total earnings of €29.6 billion and average earnings of €136,710 per year only paid €7.08 billion in income tax, an effective rate of 24%. Richard Boyd Barrett said: “It’s official – what ordinary people knew all along, what we have been saying in the Dail for the last year – the rich are getting richer and the poor are getting poorer. These facts and figures from social justice Ireland and the answer to my own Parliamentary questions demonstrate, in the most dramatic fashion, that working people and the poor are getting it in the neck with cuts and austerity while the very wealthiest in our society are being protected. All the promises in the programme for government about “protecting the vulnerable and to burden sharing on an equitable basis” have now been fully exposed as hollow. There is no equity. There is no burden-sharing. Rather, this government like the last government are using the atmosphere of recession and crisis to facilitate a further transfer of wealth from those who have virtually nothing to those who have virtually everything. Contrary to the the constant government mantra that there is “no pot of gold” and their constant dismissal of our calls for higher taxes on the very wealthy, we discover that there is a massive and growing pot of gold in the hands of the super-rich in our society. If for example we raised the effective tax rate on the highest 20% of earners to between 40 and 50 per cent, we could raise somewhere between five and six billion in extra taxes. This would still leave this group very well-off but it would allow us to halt and reverse all the cuts imposed on low and middle income earners, on the poor and on the vulnerable. The government have constantly claimed they have no choices, that austerity and pain for ordinary people was a tragic necessity. We can now see definitively that that has been one big lie. Rather they have chosen to cold-bloodedly to attack the poor and protect the super-rich. That’s why it is vital that ordinary people , who are the victims of these unjust policies, begin to mobilise onto the streets. Only people power, protests and strikes can challenge this obscene injustice. Just in case you (and the Labour Party) missed this….. I cannot believe what the ILP has come to – the party I supported for 40 years! It’s a sad day for the party and a sad day for the country …not the whole country of course; just the bottom 25% that (used to) support the Labour Party. I guess it’s now just the public / /civil service that supports the party; oh, hang on a minute: don’t they vote for the FF…ers? Shane Ross calling for a No vote in the referendum. Independent Dublin South TD Shane Ross has ended weeks of silence by declaring he will be calling for a No vote in the referendum. Mr Ross used the pages of his former employer The Sunday Independent to announce his decision today. In a column, he claimed that he was “passionately pro-European” but said he could not vote yes because “we are being compelled to vote in a twilight zone”. “The full package is shrouded in uncertainty. Little light will be shed on it until long after the polls close on Thursday,” he said. The normally outspoken Mr Ross had until today refused to state publicly his voting intentions. He had been one of six parliamentarians who had called for the referendum to be postponed and had unsuccessfully tried to introduce legislation in the Dail that would have the effect of delaying the poll. Labour has turned its back on its election promises and have betrayed the people! Couldn’t agree more. The problem is that most Irish voters have a sneaking admiration for gangsters of this type (witness Michael Lowrey in Tipp North). Is it that these eejit voters think some of the ill-gotten gains will rub off on them? We know it’s not any kind of “good on ye’ mate” because that is not the Irish way (begrudgery replaces that). Is it that these peasants have a slave-like adulation of their masters (legacy of 700 years of occupation?)?. Is it plain stupidity? I defeats me anyway. I’m 62 now and I’m mesmerized at the imbecility of the Irish voter – the idea that Fine Gael would offer a viable alternative to the FF…er party beggars belief. 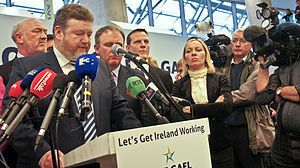 FG are more crooked, not less than FF! Labour have taken the soup (and smoked salmon) and are, in the words of Gilmore (referring to Frog Cowan), economic traitors to their electorate. But who will take the pensions off the criminal TDs / MEPs? …Other TDs? …I doubt it – they know only too well that such a move may rebound if they engage in dog-eat-dog tactics. Just as Irish doctors don’t challenge their peers and Irish lawyers didn’t challenge their peers when they are proved corrupt I cannot see shister-TDs doing any different. It’ll alway be the inside-elite -v- the decent people. The only way is to remove the insider-elite from power via a ULA-led government. Next time? We can hope I suppose. Maybe the Irish will wake up and vote in their first ever left-wing government who will represent their interests (rather than the interests of tyhe insider-elite)? Currently, Ireland is the only country in Europe that never had a left-wing government!! !